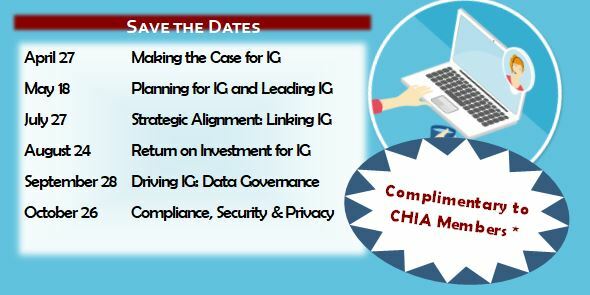 The 2017-2018 CHIA Information Governance Committee is pleased to announce the Information Governance (IG) Web Series. This seven-part series will provide a foundation of valuable IG topics to HIM professionals. Utilizing AHIMA’s IG Training Kit, these informational webinars will increase your knowledge of IG. In an increasingly connected world, this extends outside the proverbial four walls of an organization to make sure that information is available in the right place and the right time to support health and health care. This IG Web Series aims to prepare HIM professionals to meet the growing demand. Separate registration required for each webinar in the series. 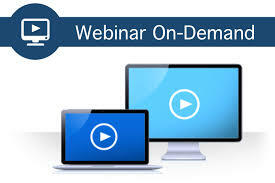 Webinars will be made available for registration one (1) month prior to event date. * CHIA Members receive the IG Web Series complimentary . AHIMA Members in CA can join CHIA and receive this member benefit. Price reflects $50 annual membership fee. All subsequent registrations in this series will be complimentary. Non-Member pricing is $35 per each webinar in this series / $55 per on-demand bundle. This presentation will provide you a base in the IG Principles for Healthcare, what support systems are used to implement IG programs and processes, and discuss why IG is important for health care. The presenter will be walking attendees through some of these base items and helping orient professional around the ideas at the heart of IG. Approved for 1 CEU by AHIMA, AAPC, and BRN. Domain: Management Development. 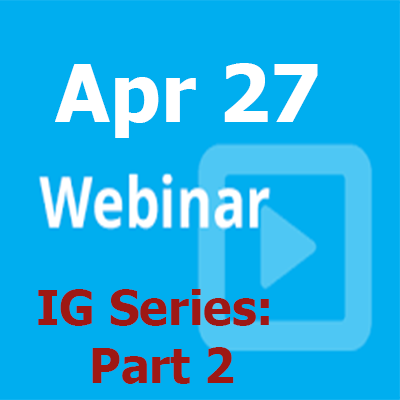 Missed one of the IG Series webinars? No problem! CHIA offers a convenient solution with Webinars On Demand, which are available for purchase after the live event. Learn more and view all the available recordings here .